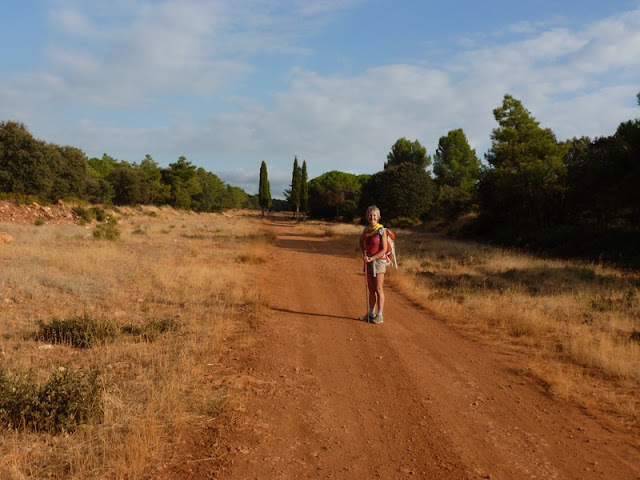 10 hours walking today, just a bit too far, particularly as the countryside got a little bit boring in the middle, endless fields of olive and almond trees. It was made worse by some confusion after lunch when we seemed to end up with three different versions of the route: my GPS trail, the Cicerone Guide and the signs on the ground. Would have gone with the signs on the ground but they also conspired to confuse. We knew we had to get away early so left the hotel at eight. Breakfast was not available until 10 so no breakfast. Actually it was only just light, fairly cold and the sun didn't get over the mountain until about 9.15am. 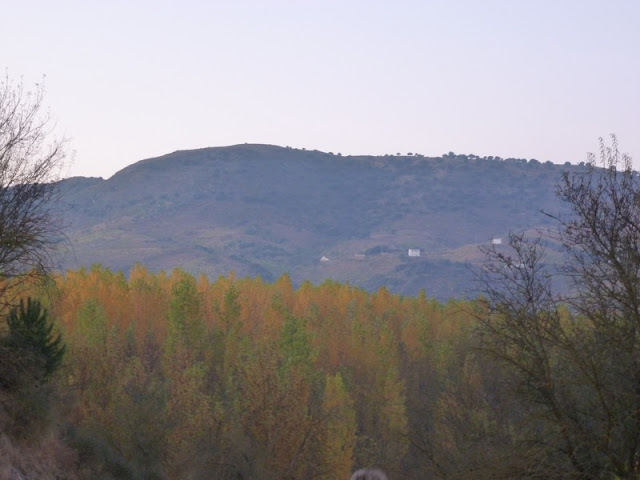 One of great things about October walking in this part of Spain is the light. The sun stays low until about 11 and is low again at about 3.30 and the softer light on the autumn colours of the landscape, lots of ochre, is just wonderful. The particular treat walking up the valley were the poplar plantations. Not sure why poplar is such an important tree in these parts, they are even irrigated, but at this time of year the leaves are a golden yellow and spectacular just before dawn. After about 5 kilometres you climb out of the shallow valley, with its poplars, and for a time you get above the tomato plantations and you're walking through autumn stubble. 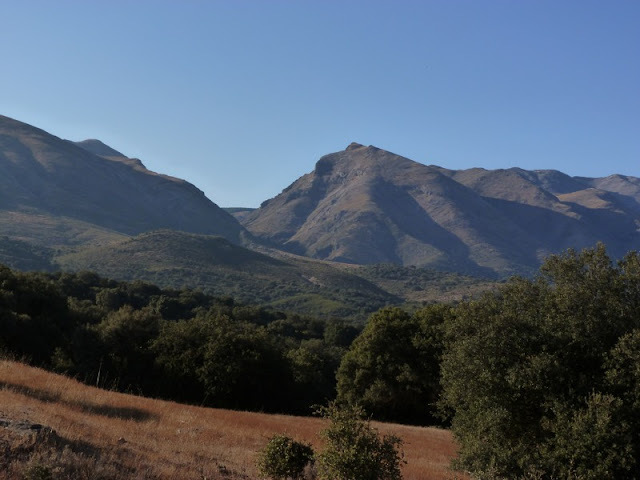 Great views south with the Sierra de Almijara, a line of mountains which get to over 2,000 metres. I guess October is a serious time for hunting and we kept coming across men with dogs and guns - not quite sure what they are trying to kill, but we didn't hang about to ask. 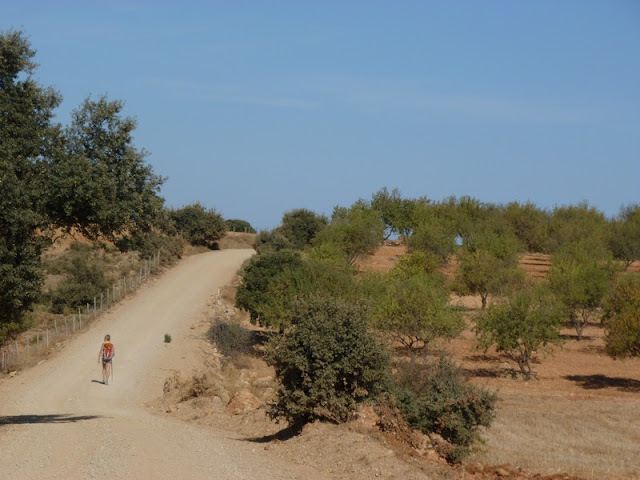 By about 11.30am it was starting to get hot, the countryside was dominated by almond and olive trees and the dust on the trails was beginning to kick up. They almonds and olives went on and on. The trails by the way are all used by vehicles of one description or another and every so often one would come past and coat us with dust. So after what felt like quite a trudge - a morning walk of 21 kilometres - we made it to Arenas de Rey which sits at the southern end of a huge reservoir. Completely destroyed by an earthquake in 1884 the village is not very attractive but we were looking forward to a break and lunch. We found a bar, they were very friendly but the food was grim and annoyingly expensive. Not set up as we anticipated we set of into the hot afternoon sun and after about half an hour we following a trail south past endless huge canvas greenhouses housing row upon row of cherry tomatoes. The signs eventually petered out and we seemed to be a long way off my GPS trail. Christine refused to go back down cherry tomato alley so we decided to bushwhack our way up over a ridge to a point close to where the GPS told us we should be. This is always a risky strategy and sure enough the descent on the other side of the ridge was very steep and overgrown with the thorniest and prickliest plants imaginable. I went ahead leaving Christine to disturb a family of wild boar who were deep in the undergrowth hiding from men with guns and dogs. Got down the ridge the other side and found some more GR7 E4 signs, still in the wrong place according to both the guide and GPS route and worse still not taking us to Jayena. We deciding to ignore the signs and head for the old resin factory which we knew was on the right route. I think we must have wandered along a GR7 variant. La Resinara is a melancholy reminder or the resin industry which flourished locally until major forest fires 30 years ago. From there the path improved, uphill on a winding track through pines then along some beautiful forest drives alongside a tiny airstrip where a little Fokker was showing off it's take offs and landings while we walked past. By this time the harsh sun had disappeared, the autumn light had returned and magically the scenery improved. We were tired but soon the path started descending and we caught a glimpse of Jayena encouragingly near, just 2k away. 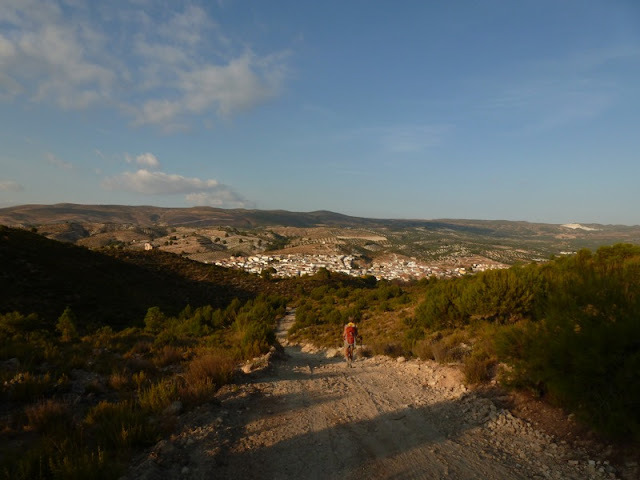 We finally got to Jayena at about 6.30pm which was actually on schedule despite the bushwhacking. In the bar for about 7.30, had the most amazing tapas followed by a large plate of rabbit stew. Everybody was watching a programme on the television which had men with guns and high tech bows and arrows roaming around the Canadian tundra shooting Caribou and Bares - not nice. Hi John, as I shall hopefully get to Jayena tomorrow - do you still remember the name or location of said bar? I can't I'm afraid but we stayed at the Hospederia Rural La Almijara and the restaurant there was shut on night we were in town (it was a Sunday) so it wasn't that one. It was in the centre of the town and was the place where the locals went. To be honest, as I wasn't camping I didn't pay this as much attention as I would have done. Not sure is the answer. The villages are not that far apart however. Thanks for your answer, John. I will soon be passing through the area. I'll try to remember to post about water just in case anyone else is interested. Unfortunately my legs and knees seem to be older than the rest of me! I have to take it slow and keep distances shorter than I'd like to, therefore I have to be prepared for stopping when the time is right. I always have to figure out how much water I need to carry for the longer jaunts. I normally do my hiking/camping adventures in Scandinavia where water is plentiful. First time in Spain and looking forward to it.